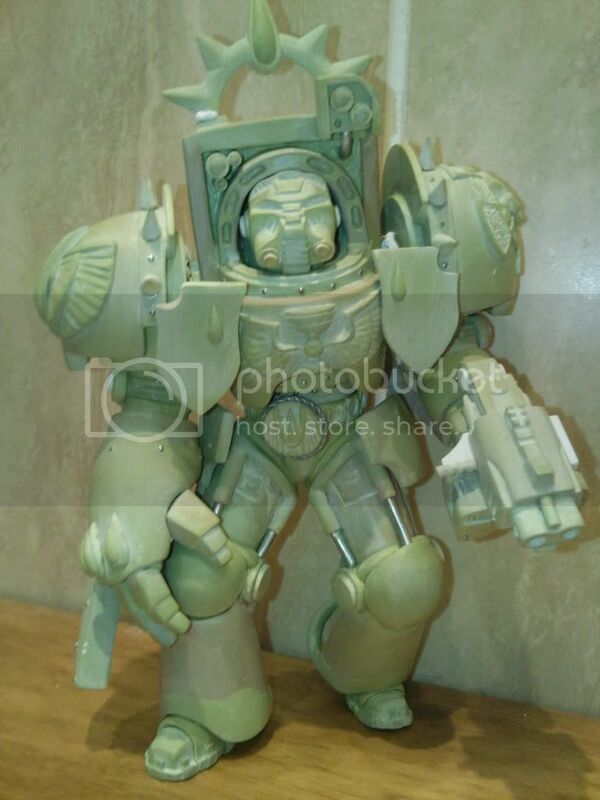 Yeh, the original plan was to have him at the same scale as the marine, but gradually some size increase crept in to keep the termy in proportion to itself. But it became clear that just a few cm in height increased resulted in a different scale altogether. I don't mind, really, as the models were never meant to be 'paired-up', I just really like that (rough) size scale to paint. Screw this "proper" business. How much?! How much?! All in all, he spent two months on it and the speed of his progress was amazing as the finish is of very good quality I think. Those surfaces are slick and smooth as hell. Pretty damn cheap, all things considered. Would probably cost five times that from Forge World. What are the actual dimensions? Well, I gave him a quick measurement and he's standing 19cm from the bottom of the feet to the top of the armour. And he's roughly 14 wide from shoulder to shoulder. Too bad you're not down in my neck of the woods. Could make some silicon moulds from him and cast you a whole squad. Hehehe nifty! But on the other hand, i wouldn't want anything to do with GW's legal hit squads bearing down on the sculptor and beating to a bloody pulp. Oh man, that marine came out sweet, can't wait to see what you do with the termie. Thanks mate! If all goes well I'm starting the biggie this weekend. Here's the reworked Skully. I just gave it a light wash of devlan mud+gryphonne sepia+water. Next I played around a bit some weathering powders, which I applied with just Vallejo acryllic thinner. Oooh. Yes, much better. Actually looks like a skull now instead of limewashed rock from someone's garden. Cheers guys! Hehehe, well, I did actually send that pic to Forgeworld last night. 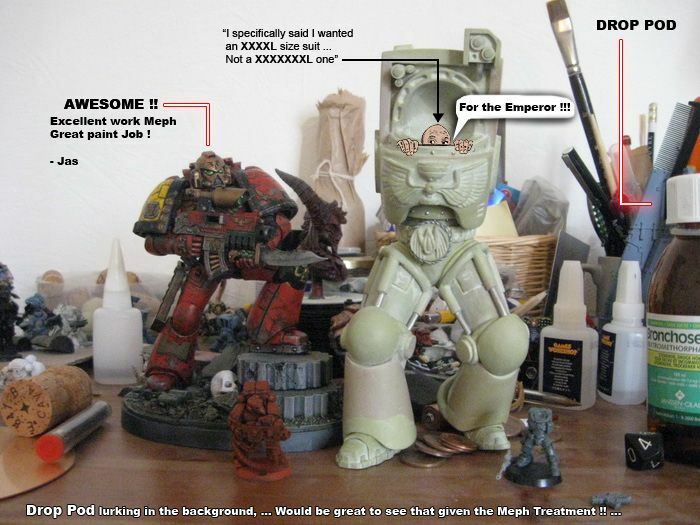 Some time ago, after a follow-up mail for something or other, one of the Forgeworld people mentioned that they're always eager to see what people have done with their models. Little did he know that I would take him up on it. Muhaha! Very very cool man. Good job. As a request from someone over at DakkaDakka, I made two 1920x1080 backgrounds, threw 'm together in an hour. I actually managed to get second place in the GW Lowlands Painting Competition in Amsterdam, even got a mistyped mention/listing on the GW site, yay me! I didn't attend the Amsterdam session myself sadly. With the fuel costs these days it would've cost me around 140 EUR for fuel and parking and that was a bit steep to go just show a model for a competition with nothing to win. So the GW folks of GW Antwerp were kind enough to take the mini along for judging. the winner was actually the same guy that also got 1st place in the Antwerp heats, where I also got 2nd place.